Preparing samples is a labor-intensive task influenced by many factors including the environment and user skill. Automated dosing with powder and liquid dispensing modules enables you to achieve the highest level of accuracy and safety in sample preparation and can reduce minimum weight by up to 30%. This minimum weight reduction means only the minimum amount of your valuable or toxic substances is required for sample preparation. Gravimetric addition of the right amount of solvent to reach target concentration eliminates variability/out-of-specification errors and complies with USP 841. The Quantos system is modular, depending on your specific dosing needs. Both the powder and liquid dosing modules can be added to the XPE analytical balance to create the perfect setup for accurate standard preparation. Add the autosampler to to allow up to 30 samples to be accurately dispensed in one automated run. What is the autosampler and how does it work? 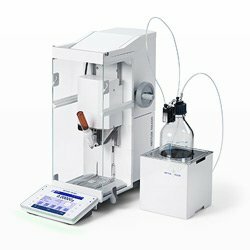 The Quantos autosampler QS30 allows up to 30 vials to be automatically filled with the powder dosing system and is an accessory to the XPE analytical balance. It is much faster than manual dosing and is used to boost productivity in the lab. The autosampler system has the unique ability to dose different amounts per vial and records the fill weight in one step. Different-sized containers, including capsules and vials, are filled quickly and automatically. Six racks with five positions are placed in the autosampler and make exchanging vials easy. What is a powder dosing module and how does it work? 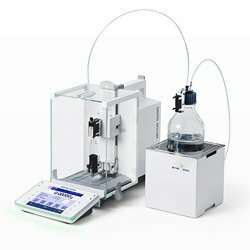 The powder dosing module is mounted on the XPE analytical balance and provides the dispensing functionality. The dosing unit allows both powder and liquid dispensing based on dosing heads. Quantos uses an automated process to dose free-flowing powders directly into a target container. What is a liquid dosing module and how does it work? Solvents are dispensed automatically into the container on the balance. The Quantos liquid dosing module dispenses liquids in a fine jet with individual drops weighing less than 1 mg. To achieve a desired concentration, the liquid dosing module dispenses the correct amount of solvent according to the actual dosed amount of substance. Quantos automatically calculates the amount of liquid needed based on the concentration specified at the start of the process. What are the application areas for automated powder dosing? 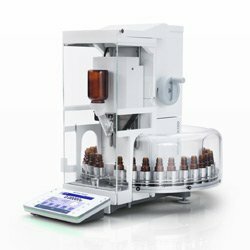 Typical applications include capsule filling, HPLC analysis, formulation and standard preparation, where the accuracy of the final results depends on precise and accurate sample weighing. Automated dosing with Quantos eliminates out-of-specification errors and avoids costly reworking. What are the application areas for automated liquid dosing? Typical applications include pesticide residue testing, oil analysis and pharmaceutical analytical workflows. The liquid module achieves exact concentrations for stock solutions and standard preparation applications. What is gravimetric sample preparation and where is it used? Gravimetric sample preparation is a sample preparation method that uses mass as the basis for measurement, rather than volume. It involves adding liquid by weight based on the recorded weight of previously dosed solids. While the principle works with both manual and automated methods, using a balance with the ability to automatically dose liquid solvent based on the mass of weighed-in solids allows precise concentrations to be achieved every time with less operator input. What are sample preparation techniques? Flask-based, volumetric sample preparation has not changed significantly in decades. The workflow is manual and time consuming, and the technique relies on subjective assumptions and steps with a high potential for human error, as well as variable and uncertain sources. Gravimetric sample preparation involves adding liquid by weight based on the recorded weight of previously dosed solids. It is a mass-based sample preparation method that avoids error-prone manual steps by relying on objective balance readings, rather than subjective optical interpretation of volume for precise concentrations. How to avoid cross contamination in sample preparation? 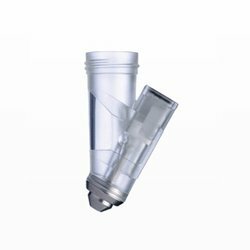 Using disposable vials eliminates the need for a robust flask-washing system and the risk of cross-contamination that occurs when cleaning SOPs are not followed. Cross contamination can also be avoided by using separate dose heads for different powder substances and sealing powders within the dosing head. Once the dosing head is filled, work proceeds with no powder contact. How can automated dosing reduce the minimum weight? Automated dosing and weighing can reduce the minimum sample weight of a balance by up to 30%. The Minimum Weight of an automated system is lower than in a manual process. Quantos dispenses powders in a closed weighing chamber with minimum user interference. How to prepare an exact concentration? Exact concentrations can be prepared by using a sample preparation method that uses mass as the basis for measurement, rather than volume. Liquid is added by weight based on the recorded weight of previously dosed solids. While the principle works with both manual and automated methods, using a balance with the ability to automatically dose liquid solvent based on the mass of weighed-in solids means precise concentrations can be achieved every time with less operator input. How to simplify the weighing process? The weighing process can be simplified by using an automated process to dose free-flowing powders directly into a target container. With an automated dosing system, a level of accuracy can be achieved which is impossible to match in a manual process, even by the most skillful hands. Simply enter the target weight and Quantos will dose the exact amount. It’s no longer necessary for operators to weigh-in potent or toxic compounds using a spatula and weighing paper. With an automated dosing process, operators work safely without exposure to substances during weighing. How to increase accuracy in the weighing process? Accuracy can be increased by using an automated process to dose free-flowing powders directly into a target container. Quantos can dose from 1 milligram to 5 grams of free-flowing powder directly into a target container. The highly-accurate dosing process eliminates variability and out-of-specification results. How to increase user safety and efficiency? Direct dosing into the target container avoids spillages which may occur when powder is transferred. Additionally, the reduced cleaning effort required further minimizes operator exposure to toxic materials. With a Quantos powder dosing system, powder remains sealed within a dosing head so aerosol formation is kept to a minimum. Hands-free dosing of the powder directly into the target container significantly lowers the risk of exposure. How to handle difficult (electrostatically charged, fluffy, hygroscopic) substances? Powders exhibit a diverse range of characteristics; particles vary in size, shape, surface texture, and density, which causes them to behave differently. Mettler-Toledo's range of dosing heads is ideal for dosing fine, fluffy, static, compacted, granular, and heterogeneous substances. How does a powder dose head work? A pin in the head pushes the powder down and seals the head once dosing is complete. One dosing head is dedicated to one substance for the duration of its lifetime to avoid cross contamination. Dosing heads are used in various laboratories across a wide range of industries. Which substances can be automatically dosed? Quantos dosing heads have been designed to handle a range of different powder characteristics, even hard to handle and electrostatically-charged powders are accurately dosed to target. How can valuable samples be saved? Automated dosing with powder and liquid dispensing modules can reduce the minimum net sample weight of a balance by up to 30%. This minimum weight reduction means only the minimum amount of valuable or toxic substances is required for sample preparation. In addition, the risk of overdosing is reduced, helping to avoid waste and save costs, which is crucial when working with rare or expensive materials. How to upgrade a balance? The Quantos powder dosing module is compatible with all XPE analytical balances. The dosing module is easy to attach to a balance and allows powder dosing to commence immediately. Automated powder and liquid dispensing. Improve safety, reduce errors, save time and money. Resolutions available: 0.1 mg, 0.01 mg, 5 µg, 1 µg. Filling capsules is a frequent and important activity in pre-clinical and early clinical studies. It is often performed manually, usually because batch sizes are too small for filling machines or different quantities are required per capsule, which is not easy to automate. Quantos can handle these challenges. Prepare powder, liquid, gel, and paste samples quickly, easily and error-free. Weigh your sample and Quantos will add the correct amount of solvent, by weight, to reach your target concentration – flawless accuracy in a fraction of the time. In this 60-min webinar, learn how to improve weighing accuracy, minimize electrostatic effects, and produce traceable audit-proof data. Discover the benefits of gravimetric sample preparation, a state-of-the-art technique described in United States Pharmacopeia (USP) chapter <1251> "weighing on an analytical balance". Find out how to recognize the causes of error and variability in weighing and sample preparation and optimize the process. Watch the webinar to learn more. Over 50% of out-of-specification (OOS) results in analytical workflows are reportedly caused by sample processing and operator errors. Using automated Gravimetric Sample Preparation and following the Good Weighing Practice™ (GWP®) can help reduce data variability and OOS results. Find out about the benefits of Gravimetric Sample Preparation compared to traditional volumetric methods. Filling capsules is a very common activity in pre-clinical and first-in-man studies, but how this is carried out typically depends on the throughput required and the resources available. Manual capsule filling is tricky and can present potential error and safety risks. Automated capsule filling machines are often expensive, in terms of investment, maintenance and cleaning requirements. Low-cost capsule boards are an extremely fast but inflexible method of filling capsules, with several drawbacks. Automated dosing with Quantos is highly accurate and reproducible, even when using small capsules or electrostatically charged substances. Materials are contained, minimizing exposure to toxic substances. Read the new case study "ETC Powder Dispensing Study" which describes the benchmarking study conducted by the Enabling Technologies Consortium (ETC). LabX® Software brings power to your laboratory bench with automatic data handling, high process security and full SOP user guidance. LabX software brings the power and flexibility of SOP workflow control onto the balance touchscreen. Technicians can work entirely from the balance terminal without the need of a PC on the lab bench. All data is automatically stored on a secure centralized database. LabX software for Quantos allows you to automate your processes with full traceability and data security. Powerful workflow building tools creates the process to match your own SOP.